Sometimes a girl just wants a big fat juicy burger. One that doesn’t require fourteen napkins or a bib around my neck would also be nice. This is that kinda burger. We’ve packed a lot of flavor into that all beef patty by using a few secrets. Well it won’t be a secret any longer since I’m sharing it with y’all now will it? But good food is meant to be shared with good people so here goes. I am a sucker for a Mushroom Swiss Burger. I love all those flavors but what I don’t love about it is the MESS that comes with that burger. 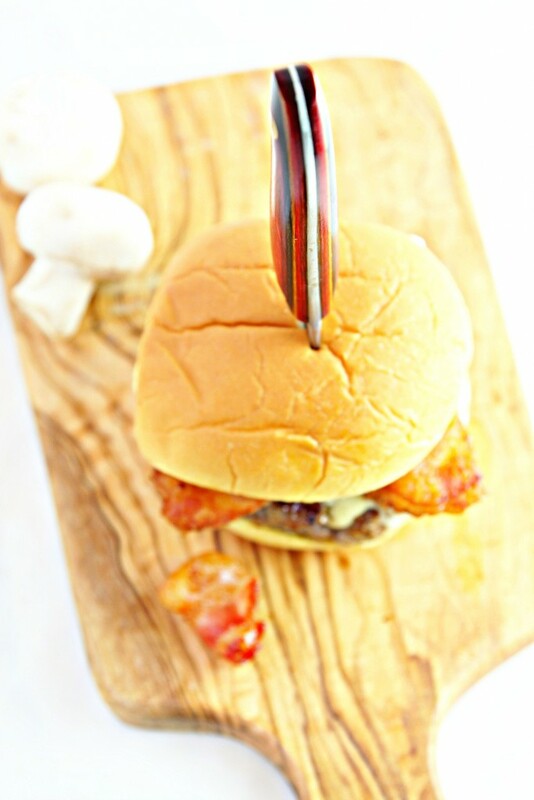 Don’t get me wrong I’ll grab the fork and get all of that cheesy shroomy goodness that falls onto the plate (I’m not stupid) but it’s a burger, and in my little opinion, I think you should be able to eat a burger with hands. Less dishes and all that jazz. That is however where I got the inspiration for this beauty of burger you’re currently looking at (and thinking you’d like to take a big bite out of because BURGER). Silver linings. Our Bacon Mushroom Butter Burger has all of the shroom goodness we love from a Mushroom Swiss Burger mixed right INTO the burger. That’s right, no mushrooms will be falling off this burger because they’re on the inside. We’ve also upped the ante with BUTTER and BACON. It wouldn’t be a burger without cheese and we’ve gone with an aged Dubliner. It’s all in the details and this burger has them in spades. Speaking of details, don’t forget to toast your bun. 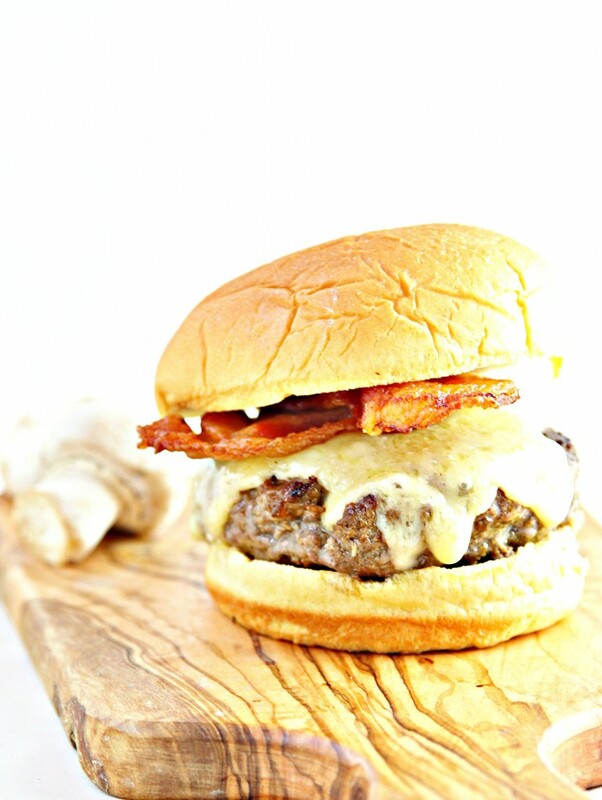 Get our BACON MUSHROOM BUTTER BURGER RECIPE. on The Mushroom Channel’s Site. I literally go crazy over anything with mushrooms! I’m in love! Oh my goodness, I swear that Dubliner cheese should be illegal because it’s totally addictive. 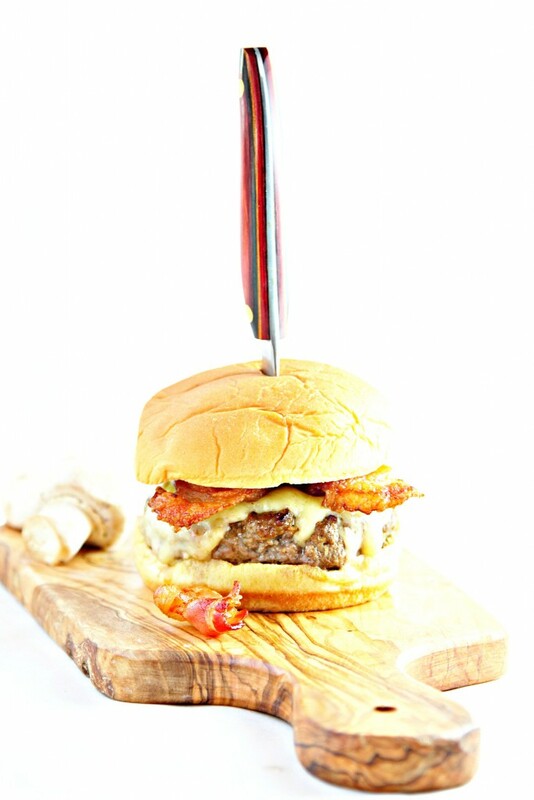 Nice twist on an otherwise sloppy burger. Not that there’s anything wrong with a messy burger. You’re just sparing us a little dignity by cleaning things up a bit. Oh my goodness, this looks amazing! I love mushroom burgers too…mess and all…but I’d totally devour your burger w/ the shrooms inside. Plus, Dubliner cheese…’nuf said. Mmmm. I’m drooling looking at that burger! On my way over to check out the recipe too! I recently saw KerryGold Dubliner cheese and had no idea what it was! I’ll have to try. And this burger looks awesome! I love a good burger but I prefer all my burger fixings to stay with it. Great idea to mix those mushrooms right in with the beef! Wow, these are all my favorite toppings combined right into the burger! Genius idea! That burger is everything summer should be! Nothing beats a great burger. This is amazing.